The Pilgrim's Philatelic Credential, a document commemorating the Camino de Santiago, was presented by the Correos this Monday in its main building in Burgos by the director of Zone 1, Ángel Pérez. The event was also attended by the president of the Federation of Philatelic Societies, Miguel Angel García, and the president of the Association of Friends of the Camino de Santiago, Jesús Aguirre. The document can now be purchased at the Post offices in the main towns of the French Way for a price of 15 euros. It is a document that gathers up to 15 commemorative stamps inspired by emblematic locations of the French Way, the Jacobean route that more influx of pilgrims manages to gather year after year. However, this credential in no case replaces the official issued by the Cathedral of Santiago and the Jacobean associations, a document commonly used in hostels throughout the Camino. In the Pilgrim's Philatelic Credential all the autonomous communities crossed by the French route (Navarre, La Rioja, Castile and Leon and Galicia) are honored by the stamps, which are inspired by places of importance in the Jacobean idiosyncrasy. In the collection we find seals that recreate places such as the Capilla de Santiago (Roncesvalles), the Puente la Reina / Gares, Santa María La Real de Nájera or Santo Domingo de la Calzada, in La Rioja. Castile and Leon is represented by the monastery of San Juan de Ortega, the Plaza de San Juan de Burgos, the church of San Martin de Tours, the Pantocrator of the Romanesque temple of Carrión de los Condes, the Collegiate Church of San Isidoro de León, The Episcopal Palace of Astorga and the Templar Castle of Ponferrada. Finally, Galicia is represented by O Cebreiro, the Ponte da Ápera de Sarria and the Cathedral of Santiago de Compostela. 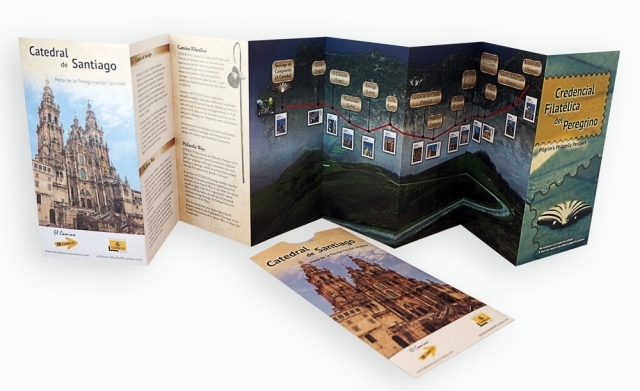 In the Philatelic Credential, pilgrims will find holes to place the special postmarks of the Camino issued by Correos in the different towns of the route, being able to seal it at the end of their trip in the main office in Santiago de Compostela, accrediting that they have concluded the "pilgrimage Philatelic ".